Many people struggling with the various symptoms of uterine fibroids turn to various natural remedies with hopes of finding relief. 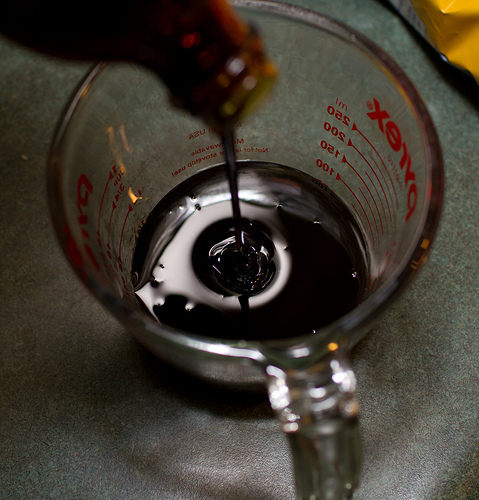 One of the most commonly recommended remedies for women with fibroids is blackstrap molasses. While there is no scientific evidence of there being a relationship between fibroids and blackstrap molasses, you may still want to consider this natural remedy when you consider the properties of molasses and how they can help heal fibroids. Molasses which is a dark, thick liquid is obtained from the refining process used to turn sugar cane into table sugar. Blackstrap molasses results from the third boiling of the cane syrup and unlike sugar which has no nutritional value and can increase the risk of developing uterine fibroids which is discussed here, blackstrap molasses features high concentrations of vitamins and minerals that remain after the sucrose (table sugar) is crystallized (process of turning a liquid form into a pure solid crystalline phase). Blackstrap molasses features a much higher concentration of vitamins and minerals than regular molasses. One of those is a very high concentration of iron which is important especially if you suffer from symptoms of uterine fibroids such as heavy bleeding which can lead to anemia which represents an iron deficiency due to the heavy blood loss. Consuming blackstrap molasses can help to keep iron levels at or close to normal levels. One tablespoon of organic blackstrap molasses is thought to contain about 15 percent of iron which can go a long way to maintaining iron levels in the body. Other important vitamins and minerals contained in blackstrap molasses include vitamin B6, magnesium, calcium, manganese, potassium, etc, the benefits of which were discussed in the article – The Best Supplements For Fibroids. All these vitamins and minerals are an important component of a fibroid shrinking diet and you get them all with just a tablespoon or two of blackstrap molasses. This rich nutritional content of blackstrap molasses is not only beneficial for those suffering from uterine fibroids but can also help with health preventative steps such as natural cancer prevention, free radical damage prevention due to the antioxidant manganese, promoting bone health, heart health, colon health, preventing stomach and digestive issues, helping with weight loss, etc. It is also an alternative to nutrient deficient sugar and can also promote skin health by fighting against acne, psoriasis, eczema, etc. Blackstrap molasses can have an unpleasant taste but you can mix about a tablespoon with milk, water, tea or you can include it in a healthy smoothie or green juice. There are also many testimonials from women with fibroids who saw huge benefits when they mixed a tablespoon of blackstrap molasses, a tablespoon of apple cider vinegar (apple cider vinegar benefits for fibroids are discussed here) and about 8 ounces of water. Aloe vera juice can also be used with blackstrap molasses and so forth. Take whatever concoction you create with blackstrap molasses daily and give it time to work since many natural remedies take time before any benefits can be noted. If you are suffering from heavy bleeding, you may want to consider taking a tablespoon or two of blackstrap molasses two to three times a day. If you are interested in natural remedies that can help shrink fibroids and eliminate the symptoms, fibroids and blackstrap molasses is an area to consider. Get organic blackstrap molasses here. You may also want to give the holistic fibroids treatment system – Fibroids Miracle a try to discover how you can get rid of fibroids naturally within two months! hello! did it work for you? Question: do I mix Apple cider vinegar with Blackstrap molasses to help shrink fibroids ?